I think it was a Friday. I was walking to the mall near my work for lunch. At the time, it was my Friday tradition. I went to this place and ordered my lunch. She was a very friendly lady who knows what I want. I place my order, which follows with a payment. I’m fairly regular at this place and paid numerous times. But this time after I hit the Ok button on the debit machine, there was the next question. Add Tip? This is fast food. “What tip is worthy of this project?” I ask myself. It’s not like they are bringing this to the table. I will be carrying this to the table. Why should I give a tip? Does everyone get a tip? ‘Agree or Disagree: You should give a tip for service’. There was a bunch of comments. I was really surprised. This is fun, I thought. Let’s try this again. I can’t remember the second topic, but I know I started it with an Agree or Disagree. I started doing this every day. People kept commenting. People from different perspectives were talking to people they normally would not talk to. Usually, we are in our own bubbles with like-minded people. This was different. Christians from more of a conservative mindset, discussed with Liberals. And then others who would subscribe to something different or quite frankly didn’t care, chimed in. Often there were has been debates, discussions. But people started talking. That was two years ago. The truth is, I don’t have the exact date of when Agree or Disagree started, but in that time, there has been much that I have learned and observed from this process. I’d like to take the time to share about what I have observed. For those who don’t know, I live in a city called Calgary. You probably are familiar with the Calgary Stampede. We have about a million people. It would be accurate to call this city a conservative city. Yes, there is money here. Generally, people are doing well. There aren’t a lot of waves to rock here. It’s comfortable. In my time specifically being involved in the Christian Community, I would generally say the Christianity mirrors the feeling of the city. Comfortable. However, I always think it’s good to look under the surface. There is what you see, and what you might miss if you look too quickly. One of the first things I noticed is that I think that there are some real presumptions that many Christians have made about the “world” or the “secular”. The presumption at times is the “Non-Christians” have low morals or low values. Some Christians have went so far as to call them God-hating. I think from what I can see, these are dangerous presumptions. Having a faith or subscribing to a religion or not does not automatically assumes morals and values. It’s very clear that this is not the case. At the same time, I think the same can be said by those who do not subscribe to a faith that those who do have not thought that their faith, values, and convictions through. You may not fully agree with some of the thoughts, but I think that generally there has been much thought and pondering on what they think. I can say that from the perspective, not just from the Christians, you read comments from. I have had a number of years of being involved with the church in Calgary, and I do think many have thought deeply about their view. My experience with the church, particularly in Calgary, but in other places as well, leads to some comments I would like to make to Christians. I must admit part of this comes from a question that I was asked about my spiritual questions I have asked over time. There is a real sense in Calgary that many Christians have readily accepted the teachings of the pulpit speaker without challenging or questioning. We have places that are very “hyped” with their worship. At times, it comes across like a cheerleading group that encourages people to be more happy than real. And what has followed is this has led to some accepting Bible messages or theories that are based on what everyone thinks. I have a practical example to share. There was a service I was at a number of months ago where it appeared that they were trying to grow limbs. How the speaker explained it was that most people had one part of their body shorter than the other. After a long few minutes of his talk, he called people up to have this happen. Now maybe it’s my stand back nature, but this did not seem right to me. It was quite unsettling. Yet, they came up. Now I’m sure that someone felt that they had a miracle that night. I wouldn’t take that away. But in the back of my mind, I wondered how many people went up, because they wanted to be a part of the group. Or feel holy. Yet, in the same breath, are the understated and the undercurrent of the church in Calgary. That is there has been some that have been deeply hurt by the church. And perhaps some have been hurt by people in a position of authority in the Church. When I say authority, I think of pastors, or spiritual leaders that some have felt they’ve taken advantage of their position. It has resulted in some deep hurt,resentment, and questions. It feels like people know, but are afraid to say it. They have sat in the pew, or have heard a message. Something tells them it isn’t right. But there was a fear to challenge. But you can feel the move of change where that fear of feeling “right” is moving to question whether it is. And this has moved the conversation to a place where people can be open. Find people who think the same way as they do. And I’m sensing it’s not only happening with the post, but it seems to be going forward. I’m hoping people are actually sitting down and talking with their friends and family. Maybe you won’t comment on this, but you will talk with them about what you think of this. I would like to just end this by saying Thank you. Whether you only read this once and said this wasn’t your cup of coffee. Or you pop in every once in a while. Or you are eagerly awaiting whatever I’m going to post. I want to say thank you for the time you have taken to read. It truly is humbling and surprising in many ways, that people read this. Agree or Disagree: People need to say Thank You more. Two little words that mean so much, but seem to be said very little. It seems that there is a general consensus by many that we really don’t say Thank You enough. Well, there is an attempt to change that. There is a book called A Simple Act of Gratitude; How Learning to Say Thank You Changed My Life – John Kralik. Kralik started a project January 3, 2007 and went 365 days and wrote one thank you note a day.He started with writing thank you notes from Christmas gifts and went on from there. A Book Club I’m involved with will be reading this book. I will write a review. I’m also going to try something in October. Since October is my birthday month, I’m going to try to find someone in my life to say Thank you for 31 days. I will then write briefly about it. I, could improve on saying Thank you and this will be a good way to start. What are your thoughts? Can you say Thank you more? Agree or Disagree: You would date someone with a diagnosed mental condition. There is many things we discuss in terms of dating, but it is rare that we discuss this. It actually might come up more then we think. According to the WTO,over a third of people in most countries report problems at some time in their life which meet criteria for diagnosis of one or more of the common types of mental disorder. There has been more open discussion about mental illness and the issues that come with it. But, what if you knew that someone you dated had a diagnosed mental condition? What would you do? And what would you not? Agree or Disagree: The message of Premarital Abstinence has caused some unfair expectations. My friend Kristine Kruszelnicki, who blogs as the Dead Again Agnostic can create some great conversation on Facebook. One of her latest status on Facebook was this. This comment has yielded, as of this writing, 103 comments. Now, the message of “waiting until marriage” has generally come from a Church pulpit. Many religions have taught and gave assurance that if you wait until you are married, you are honouring God. And because you have honoured God, then your marriage will be blessed by God. And while some have done it, and can attest to it being true, it’s not everyone. Some couples in the church have wanted to wait, but couldn’t and have caused some guilt issues. Some singles in the church have not waited. As much as the Church will continue to promote and defend Premarital Abstinence, there seems to be some things that are not. So, what are your thoughts on the message of Abstinence? This picture will iive on in infamy. 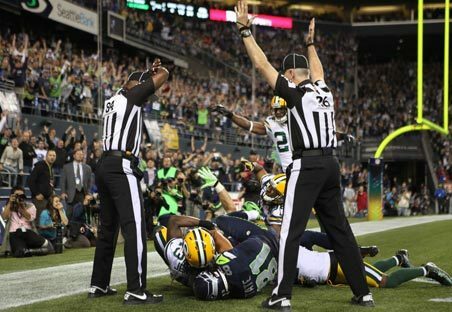 This is the final call of the phantom touch down in last nights NFL game between the Green Bay Packers and the Seattle Seahawks. You will notice that the two officials have given two rules. The one on the right signalling a touchdown and the one on the left ruling a interception and a touchback. The call was reviewed and ruled a touchdown. The broadcasters, ESPN, and quite frankly most of the NFL clearly disagreed. First, and what was not noted in this photo is that there was an offensive pass interference call that was missed. Second, although at first glance it looks like a simultaneous catch, the defensive back has the actual ball. Just to be clear, I’m a Seahawks fan. So I’m happy for the win. However I can sympathize with the Packers fans and players. Yes, they were angry on Twitter. Why can I sympathize? Well I’m a Calgary Flames fan. I bring you to this. June 4, 2004. We were getting together to watch Game 6 on the Stanley Cup Final. We were about to win the Stanley Cup, when this non goal was called. We did not win the Stanley Cup. Yes, we were angry. The officials made the wrong call. So there has been much discussion on how bad the replacements referees have done in the NFL. But, the reality is what it really shows is how tough it is to be a referee. If you don’t believe me, ask a minor hockey one and what some have gone through with parents. What about you? Can you be a referee? On Friday, I saw an interesting interview on the Jeff Probst Show on Friday. Jeff interviewed this lady who had a great job in Manhattan. Her life it seemed, was perfect She decided that it was time for a change. She decided to move to Chicago and pursued her dream of being an artist. In the midst of this, she started an experiment. She decided to make one new friend a day. Not by adding them on Facebook, but actually going out and meeting people on the street. If she had a connection, then she would ask them if they would like to be her friend. It turned out to not only help her, but there was connections made by everyone else. So her “September 4”, met her August 2 for example. Now, she didn’t connect with everyone, but through this, she made some true and real friends. I think this is a brilliant risk. It seems although Social Media has helped society, at times it seems we do have a distant community. It is hard to meet people. Not only single people, but for couples and married people. So, do you find it hard to make friends? If you don’t, what, or how do you make friends? Question: What can the current political landscape learn from the legacy of Peter Lougheed? Today was the state funeral for the late Peter Lougheed. Dignitaries including Preston Manning, Alison Redford and Stephen Harper amongst others paid tribute to the man that is considered by many the greatest premier in Canadian history. We currently live in a very interesting political climate. Both the left and the right seem to be quite divided with perhaps little balance. So instead of Agreeing or Disagreeing, I thought it would be interesting to ask what can we take from the legacy of Peter Lougheed that can help us now? Be interesting to hear your thoughts.